Declared a UNESCO Biosphere Reserve, the island of La Gomera is a paradise of natural wonders. An abundant flora and fauna thrive in its magnificent landscapes. While endless greeneries hold the blossoms of different hues, the woods and shrubs are abode to wildlife. Boasting of varying but fascinating terrain, it has one more thing, or five actually, that separates it from the rest of the Canary Islands – the Los Roques Natural Monument. In the south of Garajonay National Park, the five rock formations stand proud. Surrounded by deep valleys, these wonders continue to wow since the pre-Hispanic days. Today, busloads of tourists and cameras clicking all day prove they are one of the island’s stars. These rocks have been around for a long time. Millions of years ago, nature created them with the wrath of volcanoes. Unlike most landforms in the Canaries though, it didn’t develop through volcanic eruptions. Quite the opposite, in fact. Because magma was not released, it hardened and formed the massive rocks. Had it not been for erosion, it would have remained hidden. A proof that even the most destructive natural phenomenon can uncover precious gems. Eons after its creation, these monoliths have become a thing of beauty and deistic importance. Before the conquest of the Canaries, Guanche natives used Los Roques as a place of worship. In fact, sacrificial sanctums still in excellent condition were found on its summits. Sadly though, a group of Germans filming a documentary looted these shrines in the 1980s. The Los Roques Natural Monument consists of five unique rock formations. One can think of them as quintuplets, but each with its individuality. The huge Agando is the most prominent of the five and is commonly used as a symbol of the island. Las Lajas is flat and leaning, while Carmona is defiant and sharp. La Zarcita is small and discreet, whereas Ojila is large and commanding. 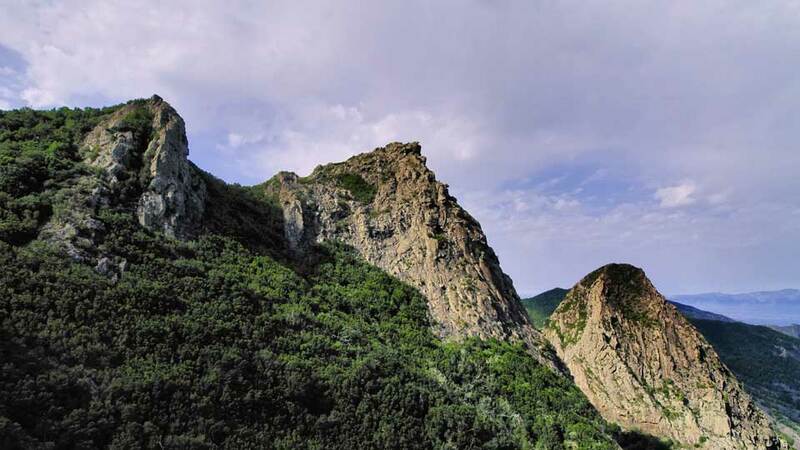 Nestled and protruding between the ravines of La Laja and Benchijigua, they are truly a sight to see. Lush vegetation highlights the enormous rocks much like a picture frame emphasizing an already delightful photo. Los Roques, without a doubt, is worthy of the attention and the “national monument” title. It’s hard to stand out from a vast stretch of breathtaking landscape in an island full of natural beauty. Even more challenging is when four others monuments are surrounding one. But Roque de Agando is unlike all others hence it deserves its section in this article. While the other natural monuments have different yet majestic shapes, Roque de Agando is different. 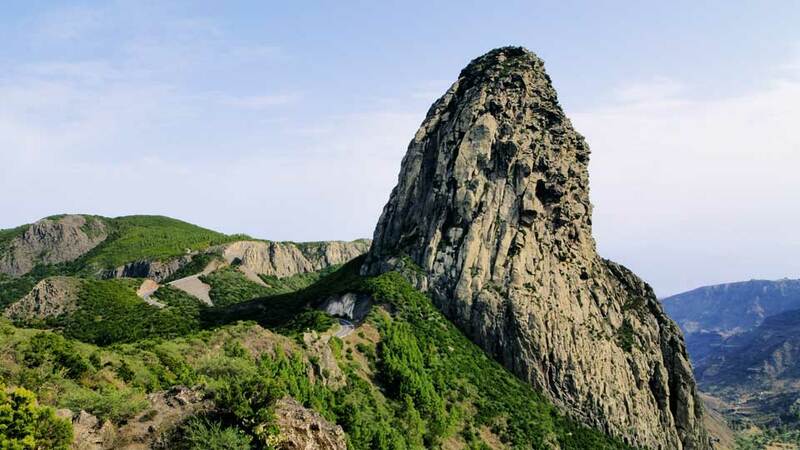 Boasting of a missile-shaped form, it rises to over 1,200 meters high. Even amidst a breathtaking mountainous landscape, it still stands out. Following the classification of Los Roques Natural Monument as a protected area, climbers can no longer scale these formations. Still, guest can still marvel at the monoliths. There are two miradors, known as Los Roques viewpoints, which offer the best views of the charmers. As an option, they can also hike the well-marked Trail 16. Although tourists can appreciate Los Roques any time of the year, the best time is during spring. The only ferry service to La Gomera is from Puerto de Los Cristianos, south of Tenerife. 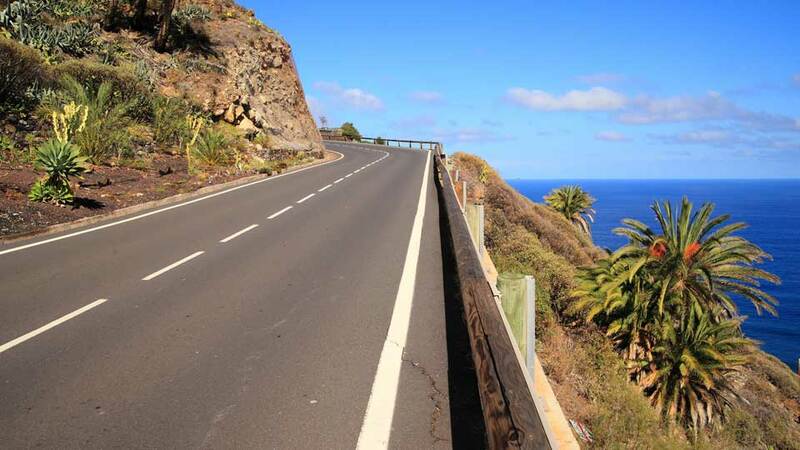 It only takes around 45 minutes, and the destination is San Sebastián de La Gomera. Tenerife has two airports, Reina Sofia (TFS) and Los Rodeos Airport (TFN). Fortunately for tourists, both airports have two flights to La Gomera every day. For those coming from Gran Canaria, there’s one flight a day from Las Palmas de Gran Canaria Airport (LPA). Those who took a ferry ride will have to go around the island from San Sebastián. Take bus line 1 from San Sebastián to Chipude or Valle Gran Rey. Now, this bus only passes Los Roques; it will not make a stop. For those who flew to La Gomera, they land in Playa Santiago. From there, they can take bus line 2 to San Sebastián and then bus line 1. For those who want to stop at the viewpoints and go at their own pace, they can hire a car or hail a taxi. Both are available near harbors and busy towns. It is almost impossible to run out of places to see in the Canary Islands. All over the archipelago, there are the countless white and volcanic black sand beaches. Old coastal and inland towns are everywhere on the seven islands, some more so than others. La Gomera, itself, has its share of historical villages where guests can absorb the local culture. A La Gomera experience, though, is never complete until one sees its scenery. Not that guests have to travel far, but as soon as one sets foot on the island, the visual onslaught begins. Of all the most remarkable sights, one that has stood the test of time is the Los Roques Natural Monument. Formed millions of years ago, it remains standing today. Tourists come and go, but these rocks will continue to be where it is for millions of years to come.